Alright! So I'm sure we all know the Hush Hush trilogy and have been waiting eagerly for the third and final book to come out already!! I mean after that crazy cliffhanger in the end of Crescendo you would think that they would cut us some slack and release this book earlier..... Nope :) But not to worry! The release date is almost here and I don't know about you but I will not rest until I read this series. Ok, now that I'm done with my sugar induced rant, lets talk about the cover. I don't particularly dislike the cover, I find it pretty interesting. But it is not my favourite from the series. And the trailer.... well! Six pack anyone?! I'm not a huuuge fan of the series, buy I'm definitely planning on reading Silence! I still have to read Crescendo and hopefully soon, so I can get this. I believe everyone who read Hush,Hush and Crescendo can't wait to read this one! Great choice! Thanks for stopping by my blog! Great choice! I just got Hush Hush so I'll be reading that soon. The last one ended in such a cliffhanger! 12 days! 12 days and Patch is ours!! HOHOHOHOHOOHO!!! But here is the big big problem! I dunno if I read Lola or Silence first! sniff! I think I'll read Silence. 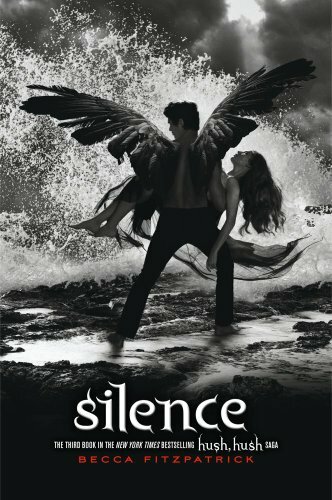 (btw, lola in canada is being published on the 4th sniff) Im buying Silence at the store and not online. I pre-ordered Lola, so I might get it 2-3 days after its release date. SNIFF!! !